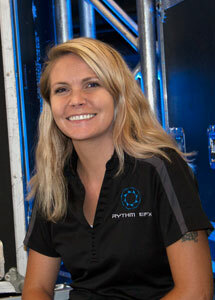 Rythm EFX is a local, family owned company, owned by 2 Fort Collins Natives and founded in 2010. 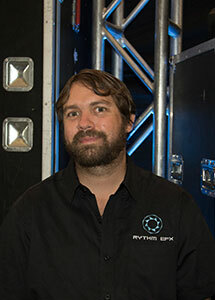 Rythm EFX was founded on a passion for Music, Production, Theatre and the passion of the people behind it all. We are based out of Fort Collins, 4 generations here in the local community and understand keeping sources and services local is important to most. Doing so, we are able to better communicate design concepts & processes as well as having a personal connection to the Colorado area and people we are working with. We have over 20 years in experience in Special Effects, Lighting and Event Production as well as Professional Lighting Design. We have a passion for Event Lighting, Special Effects, Custom Prop Building & Entertainment Events as well as working in the local community. When we began in 2010, our goal was to bring to the stage, a live production that was new, unique and cohesive to the event that the client was promoting. We were tired of seeing random lighting and thoughtless stage design that seemed pieced together to make things easy. We wanted to make a stage look and feel ALIVE and present that to the audience or guests so that that they could have the experience that they came for! We put thought into every single event, no matter what the budget is! We have found ways to make smaller budgets work with less expensive materials and we have ways to make events even greater with budgets that are larger. We are all about making your daydreams come true! What you pictured your event to look like, we can make that happen! Our designers and team members can fulfill the visions and goals you are looking for in bringing the event a great event, every single time. Zack Klassen, Lead Lighting Designer, with over 15 years experience alone in just Lighting Design and Theatre, began working in Theatre by hand as a teen and has since has taken it to whole new level. He has become well rounded in all aspects of Theatre and Production and has worked in all types of the Event Business. Zack has become a professional Lighting Designer for Theatre and Concerts all over the United States as well as taking the passion for Lighting from Theatre in School in Fort Collins and taking it to a larger scale in Event, Concert and Theatrical Designs. Zack is also the mastermind behind Rythm EFX’s Scenic Prop Shop working on some of the most custom pieces for our clients. From snowflakes, skulls, dragons, and most recently the New Belgium Tour de Fat custom “Disco Ball Death Star” was designed and built. Zack has the creative eye to turn something great into something amazing with just a few small tweaks. Part of the team since 2010, Kayzha Shepard has been behind the scenes helping coordinate all of the events and helping things flow accordingly while everyone is busy onsite. From the site ops, prep of the show, to execution and the follow up. Kayzha coordinates equipment requirements, technician and clientele needs and event logistics to allow the process of the event to develop. Kayzha also handles Client relations for events and helps keep things moving smoothly on both sides of the event by acting as an agent for both parties. Kayzha is well rounded in production and has experience in lighting, music, decor, projection, and specializes in LED Video Walls and Video Graphics. By having a good understanding of these specialities, it makes communicating and coordinating easier and much more effective. Josh, Our technical manager is one of the most important people of our company. Josh is our maintenance guru for the technical dilemmas and can fix anything (so far)! Josh also doubles as our Lead Carpenter and Crew Lead in our Scenic Department and has a wealth of experience from Theatre and Concert Production. Josh carries various certifications that are extremely important in keeping events and people safe. Josh is great at keeping things running efficiently and on task. 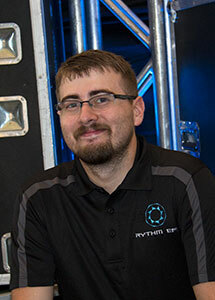 Josh’s carpentry and building skills are deeply valued at Rythm EFX as he brings skills that many others do not have and has a creative mindset for problem solving. Sam Cranshaw is a wonderful technician. Sam has been the quickest learner we have ever had and is well rounded in Special Effects, Video & Scenic Design. Sam is a valued asset in our Scenic Department, carrying a great amount of experience in carpentry, painting, foam sculpting and prop making. Sam also carries Special Effects Certifications that are incredibly important to our company and to the safety of our clients. 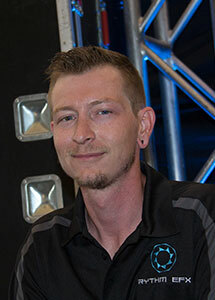 Sam is also well rounded in our Video Wall Systems and manages these systems on various shows, either independently or as a lead for the RFX Team. Sam is a great communicator with clients as well as a great team leader and works well with everyone on the team. He helps facilitates events once onsite, while leading other crew. Sam has great insight for new ideas to help systems flow better and has been a great addition to the crew. 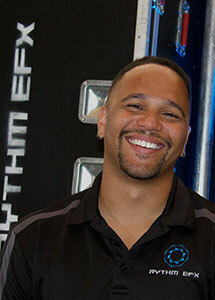 Cameron is one of our longest lasting team members here at Rythm EFX. Starting with us as a Student Intern almost 8 years ago, he has continued to learn and developed a passion for LED Video, VJ (Video Jockey) Management and IMAG Camera Operation and is a lead operator at Fiddlers Green. He continues to strive for more knowledge in the Live Production Field and has grown a great amount since his start. Cameron’s knowledge of Video Playback systems for Artist graphics and visuals is a valuable asset to the success of our LED Video Systems and Live Events. 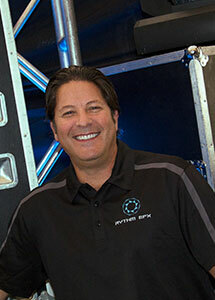 Mitch is one of our newest team members here at Rythm EFX. He has put in countless hours to best understand our services, equipment and passions. With a vast knowledge and passion of music himself he is very much in tune with what we do here. We create events that we and our clients will love for the passion behind it. Mitch has been working in various capacities of the music industry for over 30 years as well as being a realtor working with builders and developers creating luxury residential communities and building custom homes for hundreds of his clients. Mitch still keeps involved with music by playing in several bands as a drummer and electronic percussionist.